This set of 3 gauges is for use in the Saitek FIP and is an extension to my FIP gauge . That set of 3 gauges was designed to complement the Saitek AP/Multi panel and primarily showed the selected AP Altitude and Vert Spd whilst the Saitek AP/multi panel was displaying HDG. The second main part of those gauges were the Fuel Level displays, each gauge displaying a different combination of fuel tanks to suit the aircraft being flown and thus offered functionality for all types of aircraft. This set of 3 gauges is designed for the same purpose but now encompasses a working AP that allows you to select HDG, ALT and VS values and activate the HDG and ALT mode (and AP master switch) to enable auto-pilot flight (for those who have a FIP but not an AP/multi panel). For those who have an AP/multi panel, it gives the appearance of a backup AP in your build/rig ('appearance' because it all works off the same FS telemetry). The combinations displayed are those that suit my choice of aircraft, however it is easy to re-configure gauge Elements (fuel tank names) and artwork (fuel gauge titles) to suit the combination you prefer. These gauges also retain the gear, flaps and light indicators, auto rudder on/off button plus rudder and aileron trim capability that were in the previous gauges. An additional feature is the battery switch will now turn off the AP display and fuel levels. The artwork in these gauges has also been upgraded a bit and a template artwork is included to assist in customising. This package of 4 gauges is for use in the Saitek FIP. Three generic gauges will work on all aircraft and the fourth is specifically for the Baron B58 (FSX default). Each of the generic gauges displays fuel level for different tanks but are identical in all other respects. The 4 gauges have been designed to complement the saitek AP / Multi panel. The gauges primarily show the selected AP Altitude and Vert Spd whilst the AP / multi panel is displaying HDG. Five indicators for "lights on" are included as well as lights for landing gear (in transition and down) . The flaps indicator shows a blue light for intermediate positions and a yellow light when at full down position. The generic gauges have a separate flaps position indicator (numerical and needle) included. The 5 fuel indicators in each gauge are vertical analogue 'meters'. Rudder and aileron trim is displayed and controlled by the two FIP rotary knobs. Pitch trim readout and other functions is included. Still six functions available (GMT, LT, FT, chrono + OAT, Voltage) and activation through key strokes (Not for 2004). Two background bitmaps available (w/ or w/o screws). NEW: Fixed bug, reset LT, orange and green coloured screens. See readme.txt for details . FSX, P3Dv1.4 and FS 2004 stand alone XML gauge. By Pierre Fasseaux. This file was deleted by my mistake.This is the original version and it is not replaced by version 2 which provides space for buttons text. Integrated Standby Flight Display (ISFD) is a new glass standby gauge that was introduced with the B737 NG, it is equiped with an internal battery that allows 3 hours of operation without external power. Now all new commercial liners are fitted with such gauge. 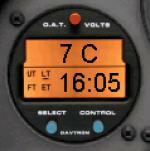 The gauge provides indicated air speed, altitude, heading, aircraft attitude and QNH. When in range of an ILS the ILS bars appear. When the autopilot mode approach is selected the text APP in green colour appears. As far as I know it is not possible to shift the QNH value from Inch of Hg to Hpa (millibar) in a FIP because the shifting function calls for internal variable like L:xxxxxx that can't be used in a FIP xml program. To solve partially this problem I propose three versions, one with the QNH both in InHg and Hpa (ISFD.xml), one with the QNH in InHg only (ISFD_InHg.xml) and one with the QNH in Hpa only (ISFD_HPA.xml). This other version of the B737-800 EICAS is the exact replica of the gauge provided with FSX and adapted for the FIP. I created this version just to test the possibility to use circular images as for the N1, EGT and fuel gauges. Not so easy but time is the main factor for success. It comes in two versions, one that shows the fuel flow (to be multiplied by 1000 like the FSX gauge) and the fuel tanks in pounds. The second version shows the fuel flow (no multiplier) and the fuel tanks in gallons. The gauge provides TAT, N1, EGT, N2, Fuel flow, oil pressure, oil temperature, engine vibration, center, right and left fuel tanks quantity. Additionally it provides the possibility to move the N1 green bug (unfortunately decimal for autopilot values is not available for FSX). Two warnings for each engine also appear: start valve open and low oil pressure. This is a second version of the ISFD for FIP. It was resized to let the left side empty to allow some text through the SaiFlightSimX.xml file to identify the buttons. The gauge provides indicated air speed, altitude, heading, aircraft attitude and QNH. When in range of an ILS the ILS bars appear. When the autopilot mode approach is selected the text APP in green colour appears. Following a remark from a Canadian simer that the speed gauges didn't provide the right True Air Speed (TAS) during cold weather conditions at very low altitude because theconditions make the True Air Speed (TAS) below the Indicated Air Speed I did change some values to get the correct TAS whatever are the weather conditions.